The PT-2300 electronic labelling machine. THE PT-2300 electronic labelling machine from Brother International offers its users the ability to be connected to a PC for greater functionality or to use as a stand-alone portable. The PT-2300 can be used for virtually any application and comes with easy to use, built in software to get the user started. Brother expects the labeller to be popular for those wanting portability together with the advantage of having advanced features through a PC connection; industries falling in this category include the electrical and cabling, retail, education, warehouse/ manufacturing and medical industries. Brother pioneered the electronic labelling machine market when it first started operating in Australia in 1989 following its success in Japan. Its dominance in the market was further backed up by its unique laminated labels. 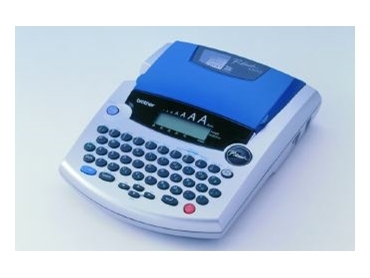 The PT-2300 has a QWERTY keyboard, 2-line 10-character LCD display and is dual operational, giving its users the choice of being used as a stand alone labeller or connecting it to the PC for greater functionality. When connected to the computer, the user can print information from a database and incorporate pictures, photos, barcodes and graphics onto the labels, quickly and easily. The machine comes with free editor software which contains pre-designed templates for endless creative uses. The PT-2300 features multiple line printing up to six lines, vertical and mirror printing and is both PC and Mac compatible. The PT-2300 has a wide range in tape colours, tape widths (6-24mm) and tape varieties such as iron on transfer tapes, instant lettering tape, fabric tape, security tape, strong adhesive tape and cleaning tape. Included with the PT-2300 is a laminated tape, CD-ROM software, tape separator, eight AA batteries and a USB cable.